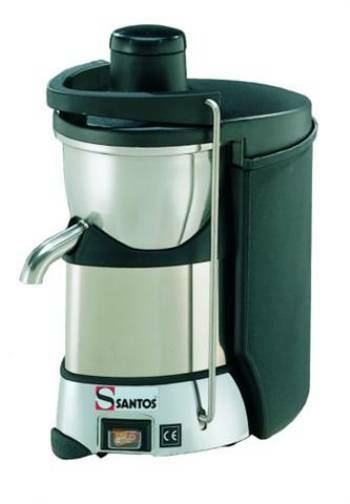 The Santos 50 Junior Pro Centrifugal Juicer (also known as Miracle MJ50,) is a Santos manufactured machine, is a compact yet powerful commercial grade juicer. The SAN50 is a pulp ejecting centrifugal style juicer. It has convenient 3" inch wide chute and can produce approximately 1 quart per minute or up to 25 gallons of juice per hour. Juicing estimates depend on type and quality of produce. The 3" chute can accommodate whole fruits and vegetables, so there is no need for cutting and dicing. Tall glasses and containers can easily fit under the 8 inch high spout. The Polyethylene pulp 2 gallon pulp container is adapted to fit the back of the juicer. Note: All fruits and vegetables must be pitted before juicing. The patented Ezy-clean™ system makes clean up a breeze.Â All removable parts can be put in a dishwasher or easily cleaned with hot soapy water. The SAN50 centrifugal extractor is perfect for high volume home use, hotels, bars, restaurants, cafes, juice bars, hospitals and anywhere that needs a juicer that can do high volume juicing quickly and efficiently. Dimensions: Height: 18â€ x Width: 19" x Depth: 10"
Spout Height: 8â€ - Feed Chute Opening: 3"